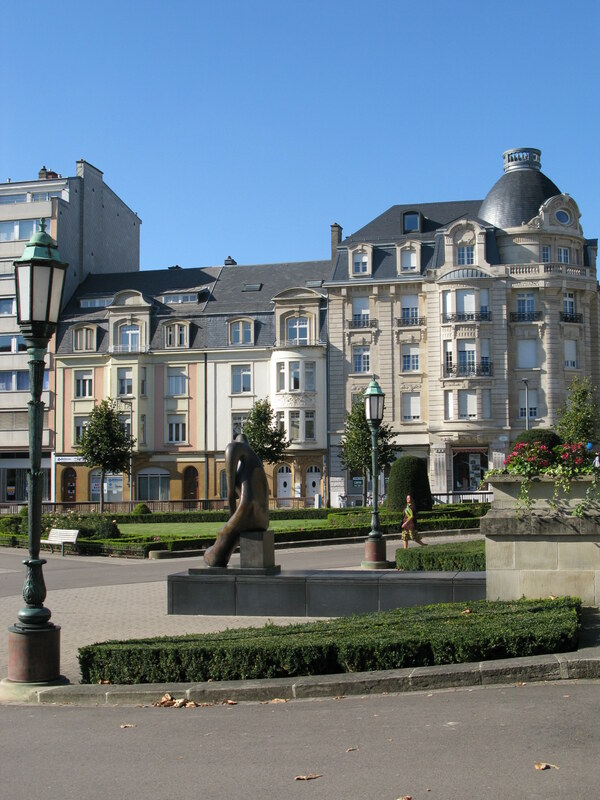 From the 'High Town' area of Luxembourg, cross the Adolphe Bridge over the Pétrusse Valley to explore history remembered in beautiful architecture all along Avenue de la Liberté. Photo courtesy Wikimedia Commons: Denise Hastert Lcensed under the Creative Commons Attribution-Share Alike 4.0 International license. The Adolphe Bridge gives high crossing over the valley of the Pétrusse River that wanders off from the much stronger and wider Alzette, which in turn is a tributory of the Sauer/Sûre river, which later empties into the Moselle. For a country of limited geographic span, Luxembourg certainly can confuse you with its rivers. The Moselle, in turn makes a natural boundary between Germany and Belgium.This is river used to high mountains and deep valleys. Its source is 715 metres (2,346 ft) above sea level in the beautiful French mountains of the Vosges. By the time it reaches Luxembourg the Moselle has travelled in all its grandeur from France and will course a further 31 km (19 miles) through Luxembourg before its union with 'Papa' Rhine at Koblenz. 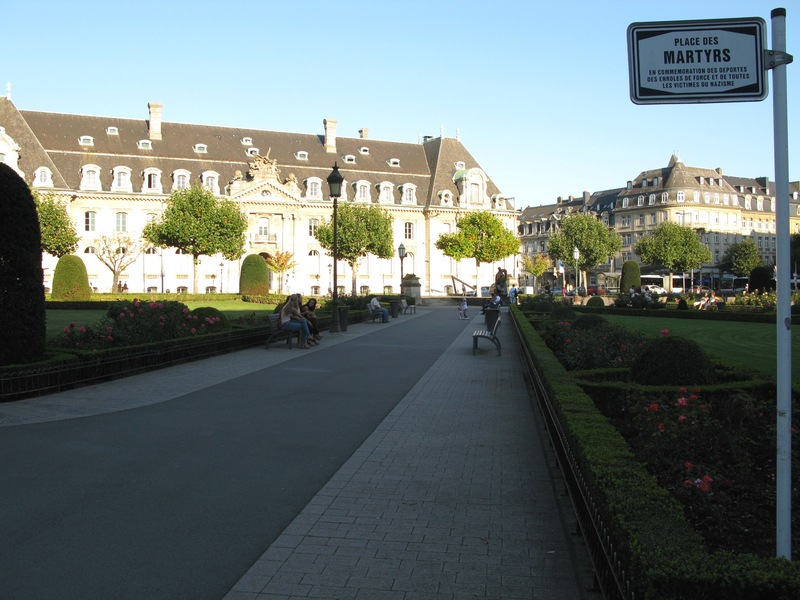 The Avenue de la Liberté makes a centre line through the 'Plateau Bourbon' of Luxembourg. 'Plateau Bourbon' consisted of four 'Fronts' that flanked the plateau with adjacent forts providing an inner, central, and outer belt, each with at least two fortresses. Where you arrive from Adolphe Bridge, you are in the area of what used to be called the Diedenhofer Front. 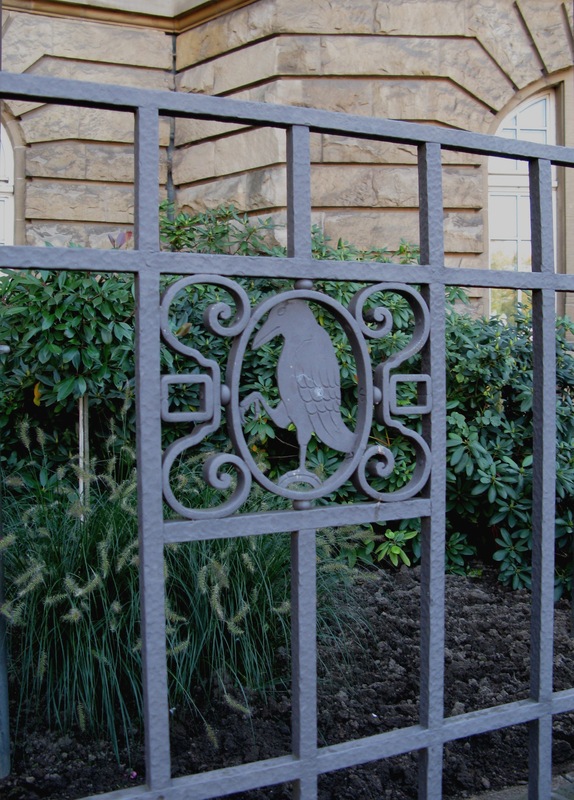 You are faced with splendour that continues along the Avenue. On one side is what is now the state bank - the Speurkees. 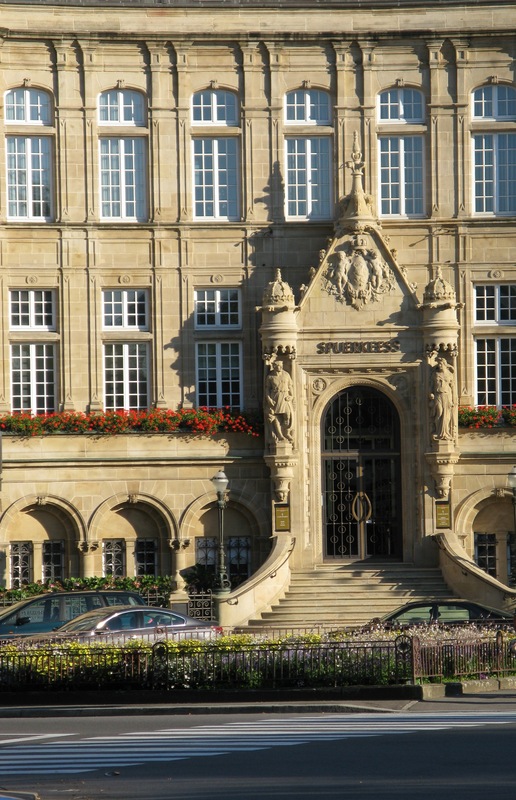 On the other side is the original building of the CECA: The Luxembourg Stock Exchange. The two state bank buildings seem a fitting pronouncement of the fact that Luxembourg is a financial capital and here one is reflected in the other. The Luxembourg plateau had been fortified since 1234 and over the centuries became known as 'The Gibraltar of the north', but in 1867, the Prussians had to retreat from Luxembourg after effectively duping the French in what is known as Luxembourg crisis. 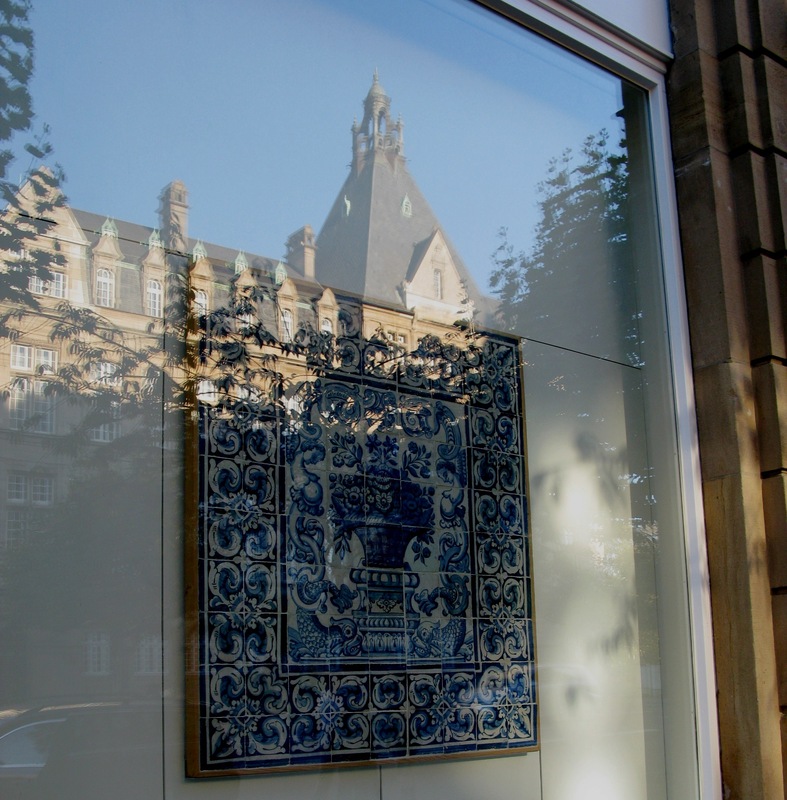 This stalemate over the future ownership of Luxembourg even made news with the New York Times, as it risked destabilising the whole continent of Europe. As the whole of Europe stood at risk, the English hosted a meeting in 1867 between the protagonists. This resulted in The Treaty of London - creating the Grand Duchy of Luxembourg as an unarmed, neutral state - which it was until 1945. Following the departure of the Prussians and demolition of the forts, the peaceful fields beyond which the railway station was to be built made a blank canvas for the aspirations of a people long dominated by their neighbours. Plans were sought from two leading architects. 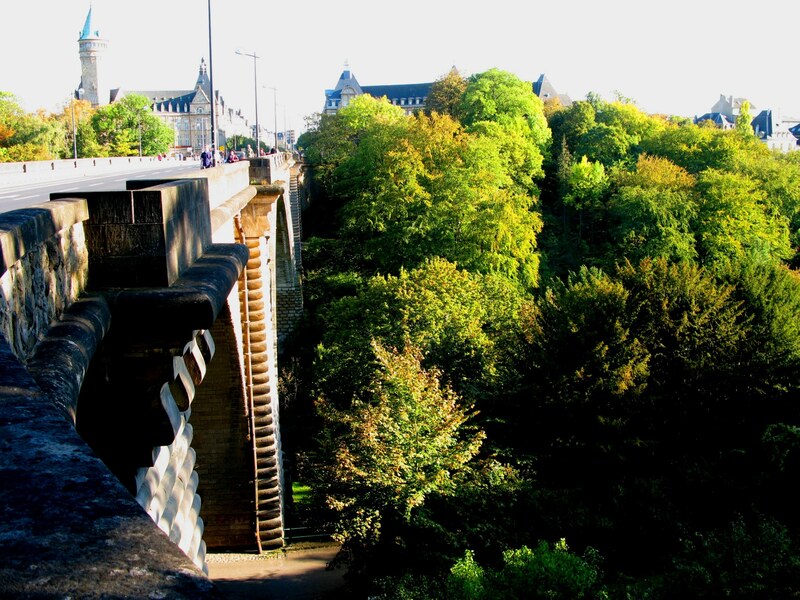 The Adolphe Bridge was opened in 1903, and by 1906 planning laws were passed creating unified regulations for the buildings spanning the eight block area from the bridge towards the railway station. 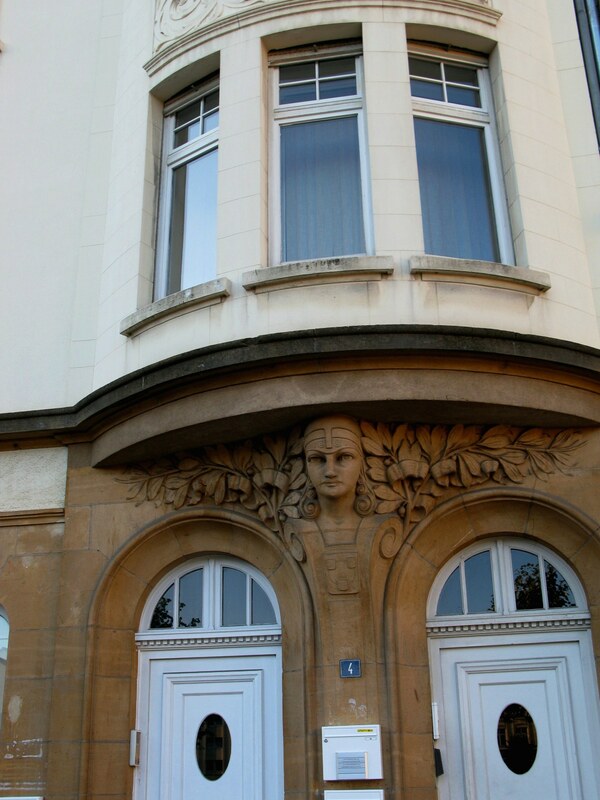 Within requirements for standardised facing stone and height of buildings, architects had a lot of room to add their own style - and most of that reflected the fashion of French architecture. 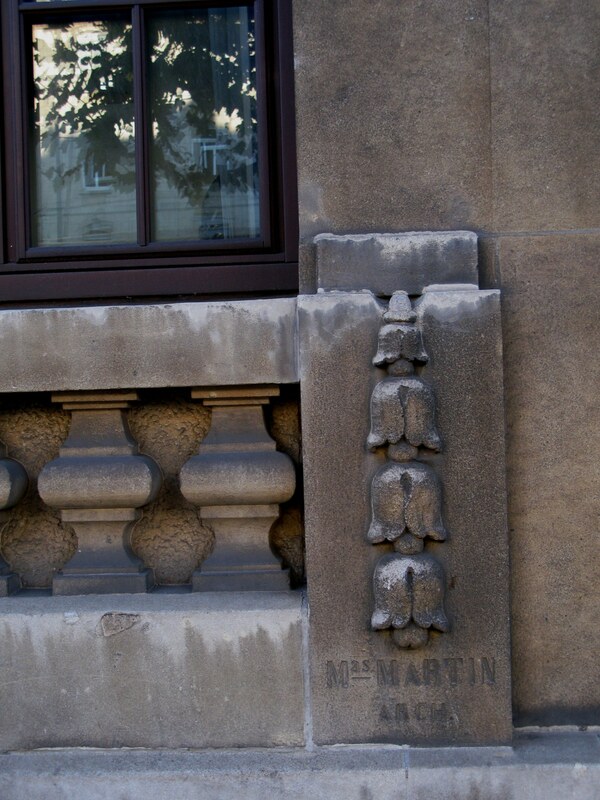 This is pronounced with french-style towers and embellishments. 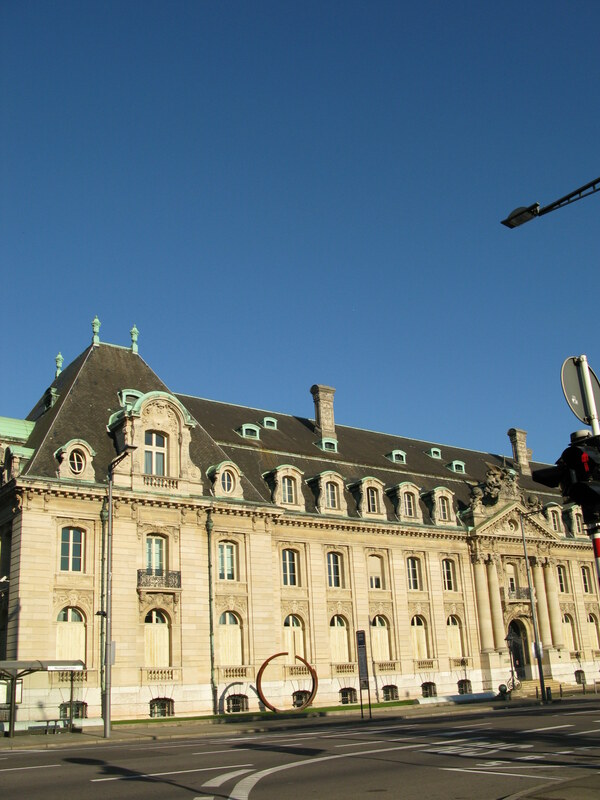 Here, the CECA - the Luxembourg Stock Exchange was born in 1952. 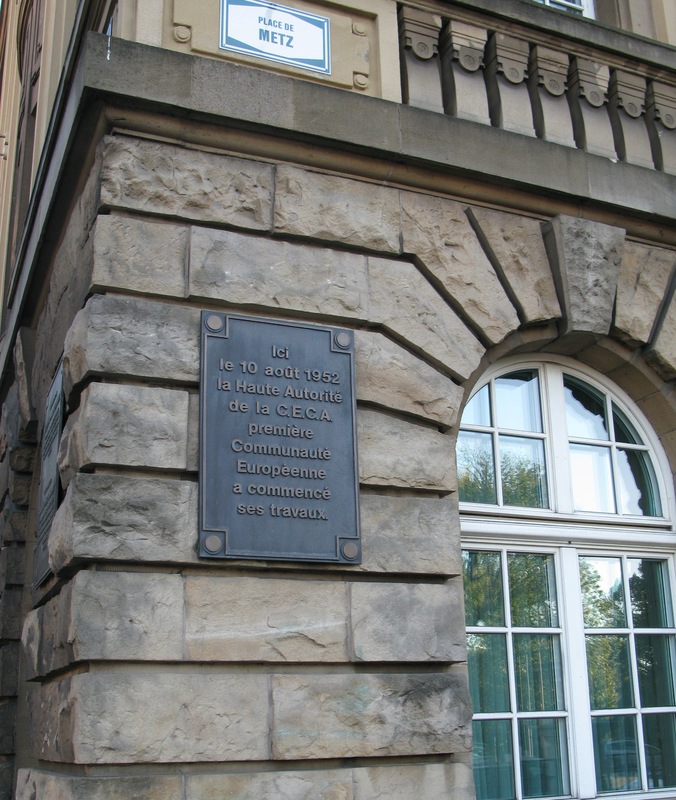 Always advanced in thinking, especially when it comes to money, the Luxembourg CECA here housed the first IBM 650 Computer. The huge IBM 650 was the world's first mass-produced computer - with 2,000 being made. IBM orginally planned for perhaps 50 - but demand rapidly grew. For us who are used to seeing the equivalent of an early computer on a tiny SD card, it is hard to grasp just how revolutionary was the concept of memory being stored on huge drums, and circuitry being managed with vacuum tubes like this one from the IBM 650. 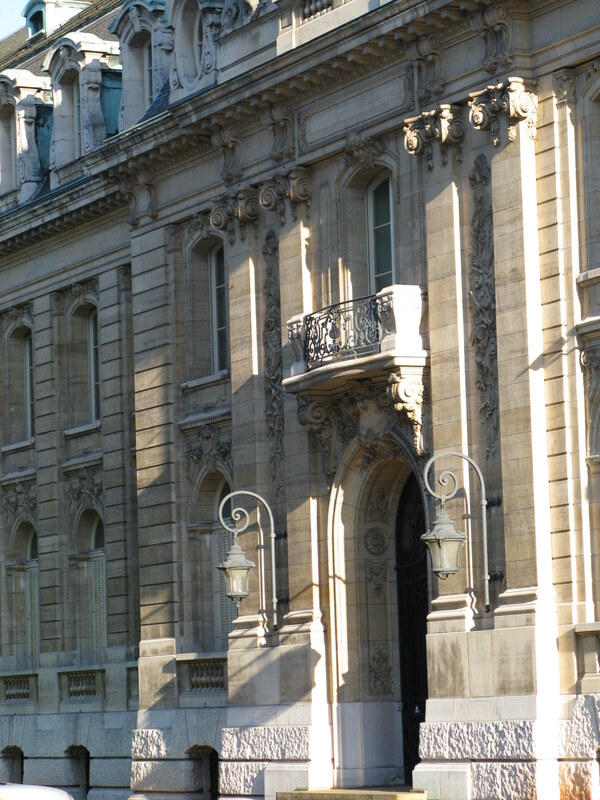 These iconic buildings along the Avenue de la Liberté have attracted historic occupants. 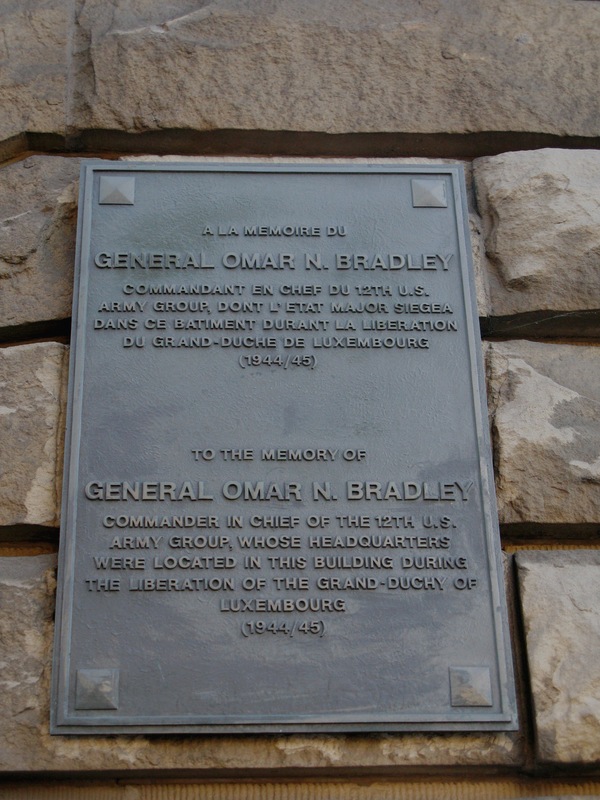 General George Bradley had his HQ here upon the liberation of Luxembourg. But the plaques I liked the best along these walls were actually in the fence. I like to think they are somehow representative of a stock exchange! 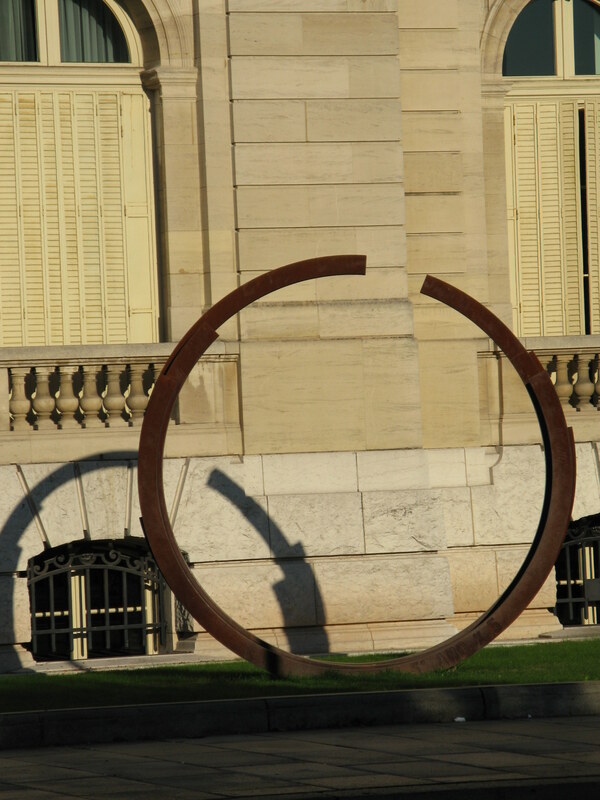 Not so quirky - but certainly modern style to complete ancient grandeur, this steel circle - ironically, and possibly prophetically, broken -sits on the Avenue de la Liberté beside one of its most iconic buildings, the former ARBED building. To me, the break in the circle is indicative of the break from this building which is today the State Saving Bank (Banque Caisse d'Epargne de l'Etat). 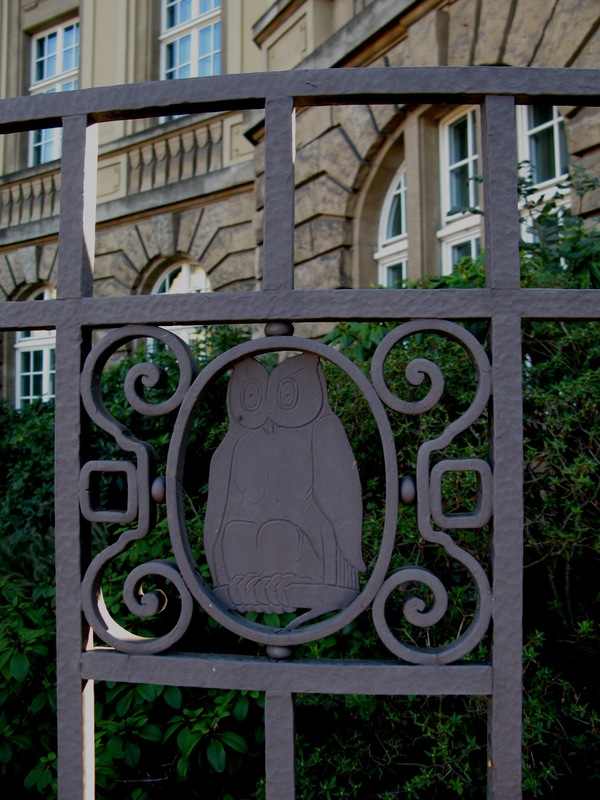 The discovery of iron ore in Luxembourg in the 1850s led to the development of a strong metalurgy sector. 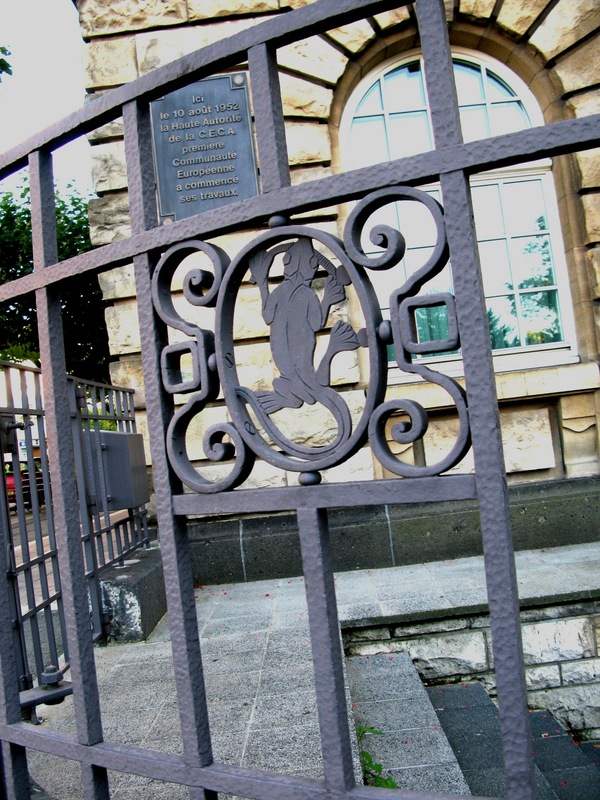 The Aciéries Réunies de Burbach-Eich-Dudelange ('United Steelworks of Burbach-Eich-Dudelange'), or ARBED - was formed from the merger of three steel companies. 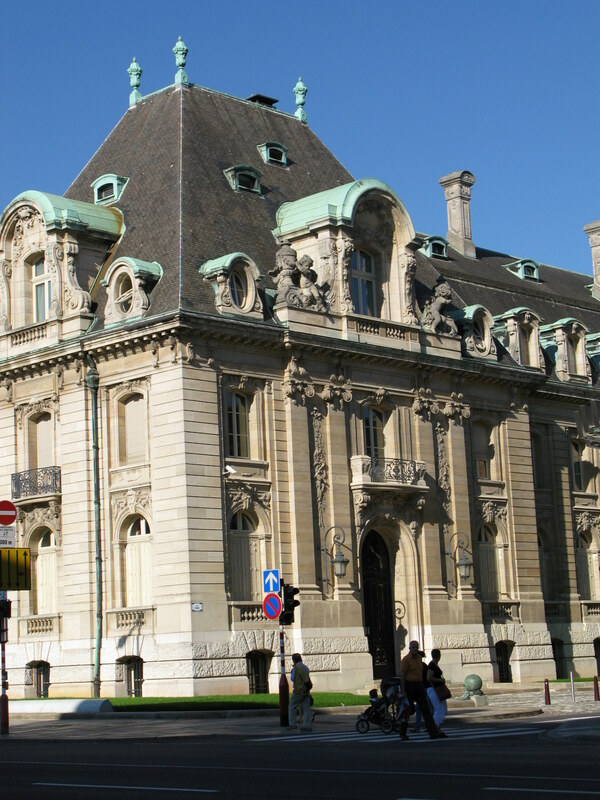 The ARBED building was obviously inspired by French chateaux design of the 17th and 18th centuries. When it opened in 1922, it boasted luxurious accommodations that included provision of salons, smoking and conference rooms, a restaurant, library, ceremonial hall, bowling alley and gym. 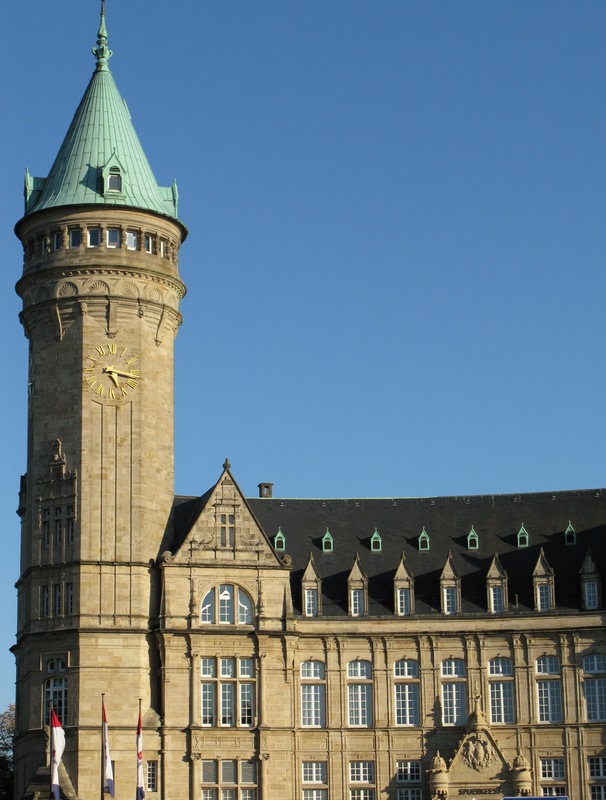 During the German occupation of 1940-1944 the German 'Gauleiter' Gustav Simon made his offices in one wing of this building. A 'Gauleiter' was a regional leader of a branch of the Nazi Party. This was the second highest paramilitary rank and during WWII such rank was only bestowed by Hitler directly. Although not a member of the SS, Simon was a brutal enforcer of the efforts to make Luxembourgers identify themselves as German. In fact, the Luxembourg Resistance was crucial to the Allied forces and Luxembourgers successfully hid and protected hunderds of Jews. Despite going into hiding using his mother's maiden name, Simon was reputedly captured by British Officers aftre the war. how, with a 24 hours suicide watch guard, this had been accomplished. 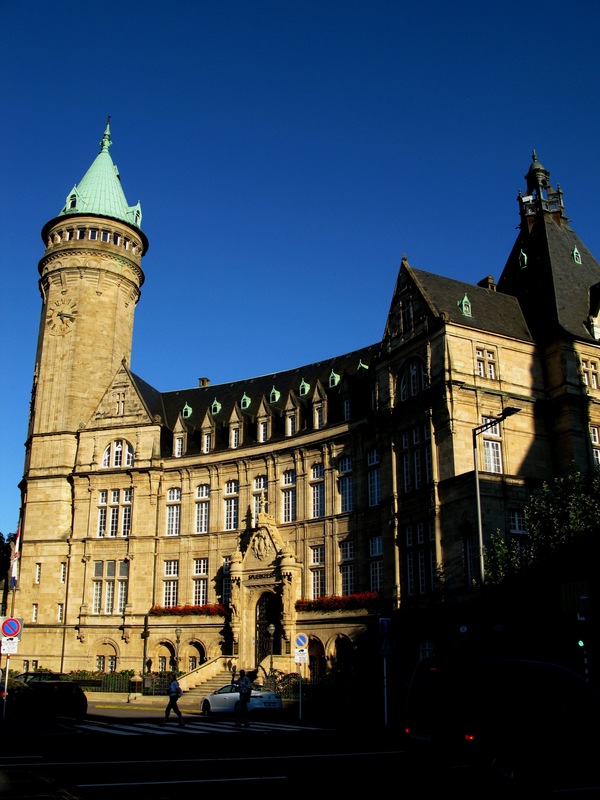 Some believe he was excuted by Luxembourg partisans or by collaborators eager not to have their identities revealed in court. 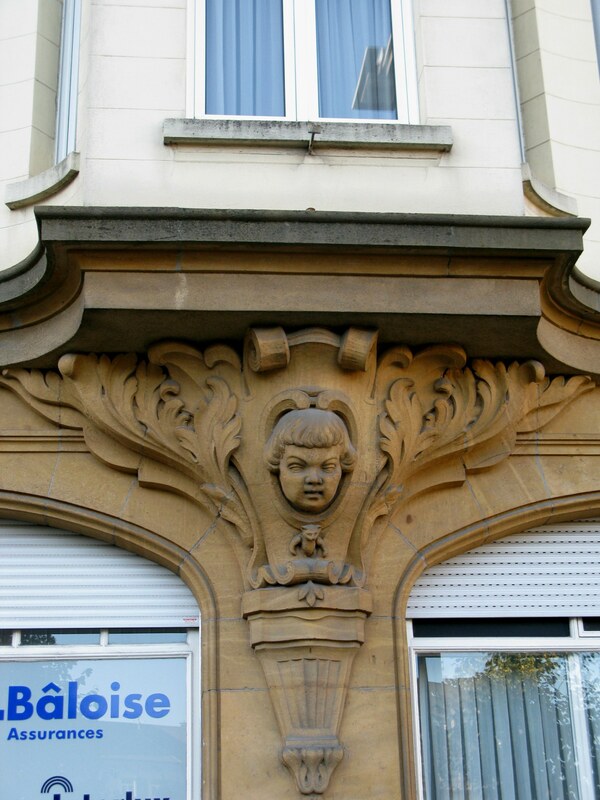 Fortunately for those of us appreciating the architecture of Luxembourg, during the penchant for demolition of the late 1960s and 70s that purged many cities of their historic fabric, listings on the façades of the buildings along Avenue de la Liberté saved them - although interiors were regularly gutted. ARBED was a significant economic contributor to the Duchy, later merging in 2002 with two other large European works to become ARCELOR. Today, ArcelorMittal is the world's leading integrated steel and mining company. 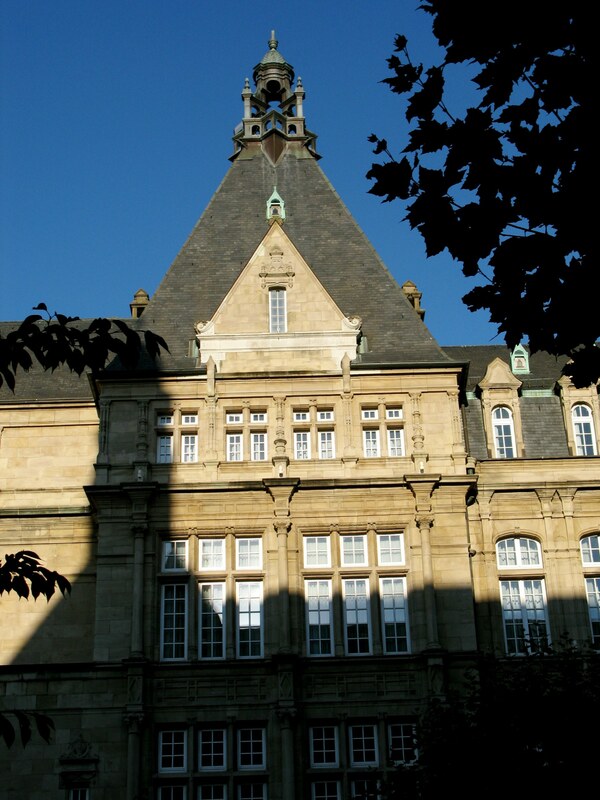 The elaborate bell tower of the Savings bank building on Place du Metz sets the tone. The care and detail of the sculptural support for this bay window above isn't matched by the slatted pull blinds in the office below. 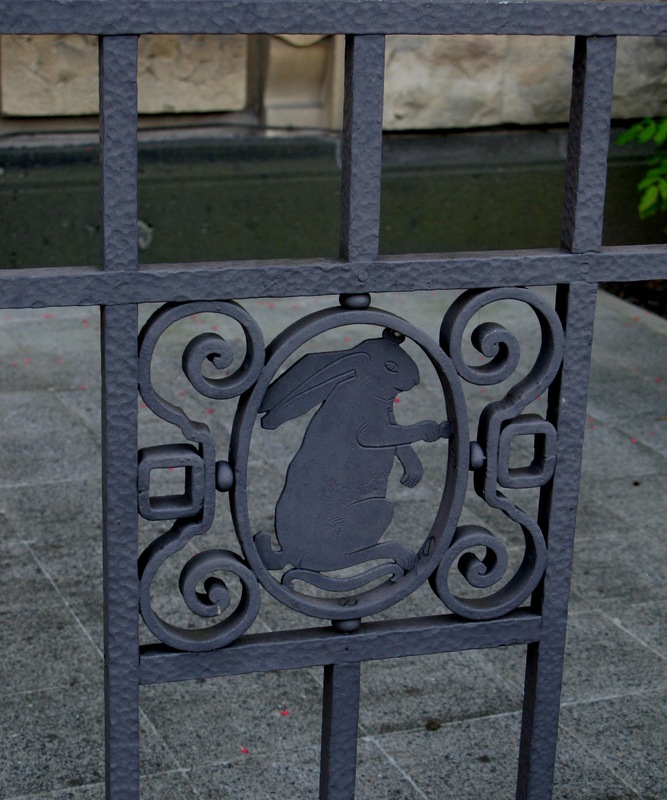 The warrior lady above these doors must give pause to those who enter. Here, the master builder has left his mark. Further along the Avenue de la Liberté you arrive at the Place des Martyrs. 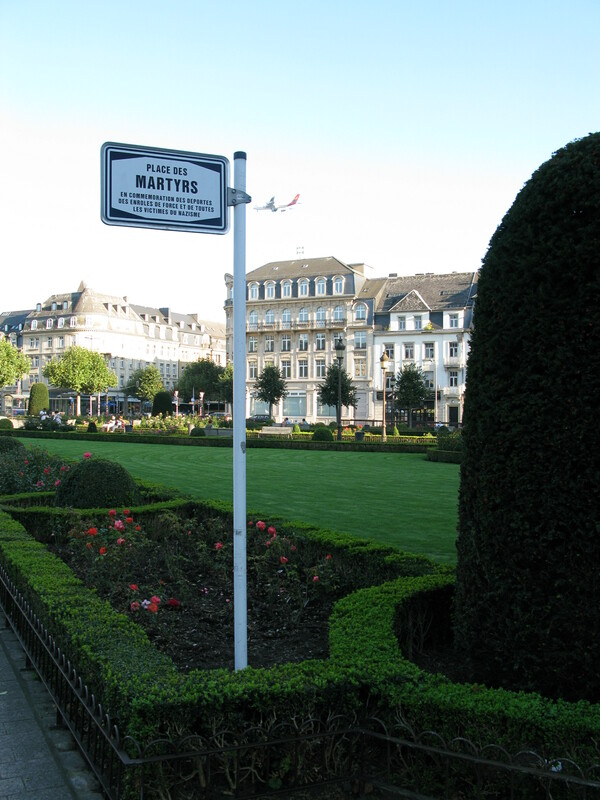 The Place des Martyrs was developed following the end of occupation by the Germans after WWI. The Henry Moore statue of Mother and child in the Place des Martyrs has her back to the Avenue de la Liberté, appropriately instead looking at the families and children who come here to enjoy the space. With a proliferation of red roses in season, this beautifully kept little park is locally known as The Rose Garden. and when this environment produces well being. 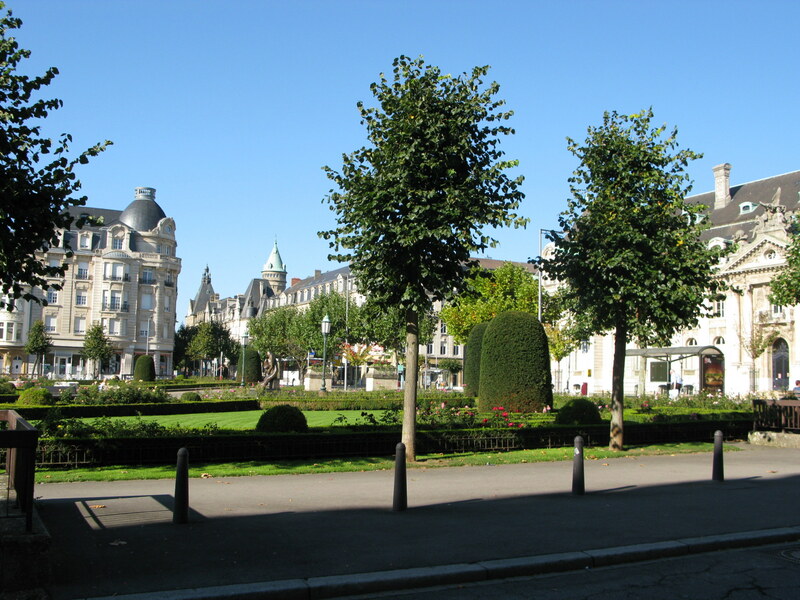 Walking along the wide Avenue de la Liberté in Luxembourg, whether you are a fan of the style of architecture or not, does create an environment of well being.